Block does not burn, warp, twist, bend, or get eaten. Block is inorganic and therefore does not contribute to the growth of harmful molds and mildews. Maintenance primarily refers to the exterior surface of a structure. Minimizing maintenance requirements begins with structural strength and the durability it provides. Block construction is among the lowest in life-cycle costs. Wall movement is what typically causes cracking. Omni Block building are always engineered and structurally strong. Block has very low shrink/swell properties and provides for a solid substrate for stucco to be applied onto. Stucco is a cementitious material and was designed to cover block, another cementitious material. Both cementitious materials shrink and swell at the same rate, resulting in very little cracking over the life of the wall. To add more durability, integrally colored synthetic stucco may be applied over either the Omni Bond or standard stucco. The block can be left exposed, which is probably requires the least maintenance. Exposed block can sometimes meet the aesthetic requirement of a building. Omni Block can also be manufactured with an integral color in a standard finish, or scored, burnished, or sandblasted. Interior wall surfaces can have the same options as the exteriors as noted above. However, the interior of the block is normally finished to match all the other interior framed drywall walls. This is routinely accomplished by skim-coating the block surface with drywall compound, then taping and texture-coating the block surface to match the texture coat of the interior framed partition walls. Then all walls are primed and painted. Even though it is impossible to visibly tell which are Omni Block walls and which are partition walls, the Omni Block walls are infinitely more durable and have significant advantages in apartment buildings, condominiums, commercial and institutional buildings, as well as, single-family homes. The National Concrete Masonry Association (NCMA) sponsored wind resistance testing on concrete block walls at Texas Tech University. 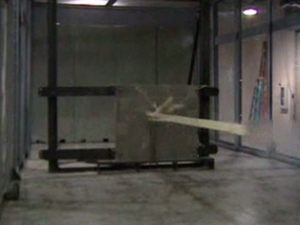 This 14-second video clip of this testing is definitely worth viewing. Please allow a few seconds for the clip to download. Any person doing their due diligence must ask themselves if the wall were constructed of wood what would its end result be? Block buildings are safer to work and live in.